When the parks close at Universal Orlando Resort your vacation doesn’t end there. 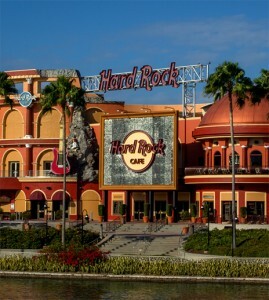 Head to Hard Rock Café at Universal City Walk for dinner, drinks and sometimes a live show! Grab a bite to eat with a side order of rock ‘n’ roll history at the world’s largest Hard Rock Cafe. Enjoy classic American cuisine and barbecue specialties including nachos, wings, and Tupelo Chicken Tenders; Hickory Smoked Bar-B-Que Chicken and Ribs; steak; fajitas; Twisted Mac, Chicken & Cheese; Hickory Smoked Pulled-Pork Sandwich; a variety of salads; ten different kinds of burgers; desserts; plus a full bar. Non-stop music videos play throughout the restaurant whose walls are adorned with an amazing collection of rock memorabilia including rare artifacts from KISS, Elvis, The Beatles, Bob Dylan and more. I personally love the Elvis room, it’s full of great tributes to The King. Follow Hard Rock Orlando on twitter @hardrockorlando and make music requests during your visit. Oh and if you find the right person let them know your love for the Beatles and you may be treated to a surprise. Are you ready to rock on your next Universal Orlando Vacation?